† Age-standardized to 2011 Canadian population. QC: Cancer incidence data not available for 2011, 2012 and 2013 diagnosis years. The 2010 Quebec data have been copied forward into 2011, 2012 and 2013. Data source: Statistics Canada, Vital Statistics Death Database, Canadian Cancer Registry (CANSIM). "– " Data not available. Provincial cancer agencies and programs. Rationale for measurement: Data and metrics regarding age-standardized mortality rates are needed to provide an accurate measure of the burden of disease across Canada. Data presented were jurisdictions combined for ages 0+. The cause of death from cancer sites/types were classified by World Health Organization, International Classification of Diseases (ICD). Up to the year 1999, the Ninth Edition (ICD-9) was used. After the year 1999, the Tenth Edition (ICD-10) was used. Mortality rates were age standardized to the Canadian 2011 population using direct method. Rationale for measurement: Data and metrics regarding age-standardized incidence rates and trends are needed to provide an accurate measure of the burden of disease across Canada. All provinces and territories, except QC which 2010 data have been copied forward to 2011, 2012 and 2013. Cancer cases with histology types 9590-9992 (leukemia, lymphoma and multiple myeloma), 9050-9055 (mesothelioma) and 9140 (Kaposi sarcoma) are excluded. The cancer incidence sites/types were classified by World Health Organization, International Classification of Diseases for Oncology, Third Edition (ICD- O-3). The International Agency for Research on Cancer (IARC) rules were used for determining multiple primaries sites. 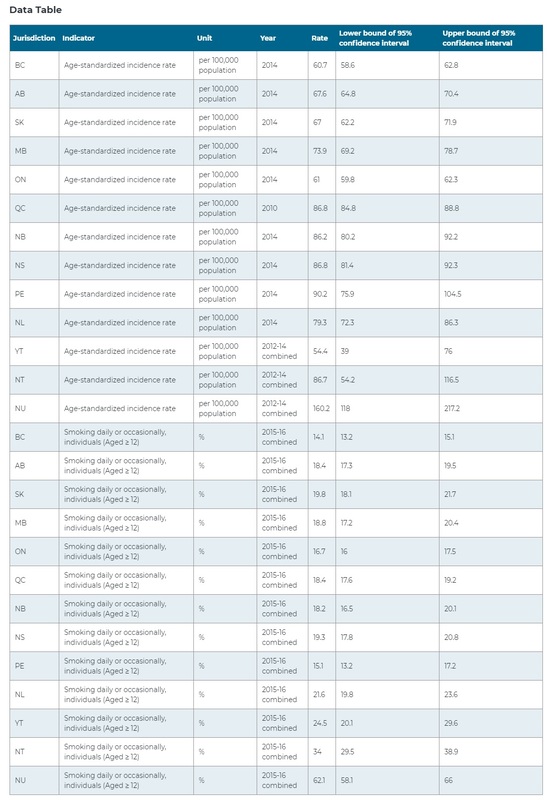 Incidence rates were age standardized to the Canadian 2011 population using direct method. † Smoking rates from each province and territory were divided into tertiles to generate groups of lower, middle and higher risk. ‡ For incidence rates for territories, years 2012 to 2014 were combined. QC: cancer incidence data are not available for diagnosis years after 2010. The 2010 Quebec incidence and population data have been copied forward to 2014 for the calculation. Data sources: Statistics Canada: Canadian Cancer Registry, Canadian Community Health Survey.